Im no fashion critic so when it comes to talking about designers and there shows this season I stay out of it. My opinion is nothing but my humble opinion on things and i never talk about things i have no remote interest or knowledge about just to sound like a know it all. 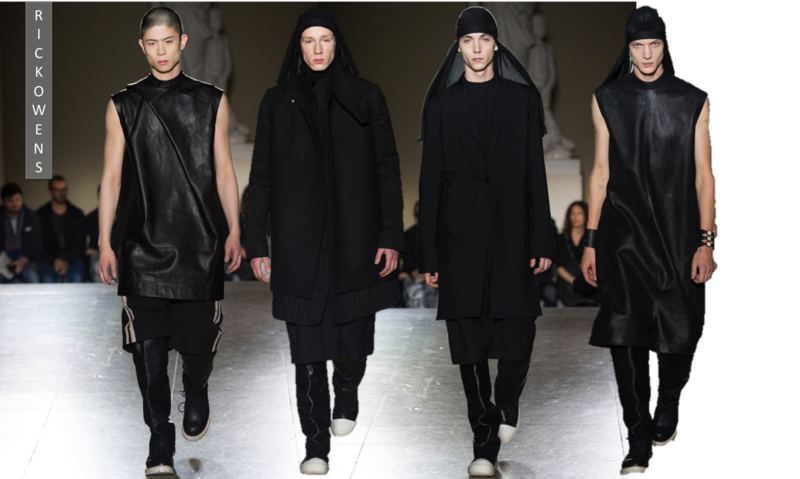 I will and only will be talking about designers I love and Rick Owens is one of them. Seriously the post apocalyptic looks never gets old and even though ive been praying left an right that the street goth movement dies because just like grunge, it is a look that cannot be tailored for the masses. It is a subculture and should stay as one hiding out in the shadows and found underground. This season we see much of what Rick Owens those well, there are no big leaps or gimmicks and thats fine because I enjoy loyal designers who knows there customers and who understands that the last thing they want is COLOURS, anything sparkly, TIGHT or even short. We just wont have it. Fashion is allot like music, you got to where you where because of that thing that makes you distinguishably you, so dont piss of your fans by introducing a new sound on your next album(INCUBUS). flexing your muscles and showing a bit of variety is fun but nothing special(so maybe like an inch shorter on those tee's) because we will buy our favourite things in bulk. But just like in music, its because they want to introduce new fans. Black, leather, draping, asymmetry, perfect balance of loose and tight, effortless and minimalistic...Basic Grunge to sum it up! , he showed that it can afford you a kind of style that only good taste can buy. So he and many others made Street goth a thing and much like Kurt Cobain, he defiantly regrets it.